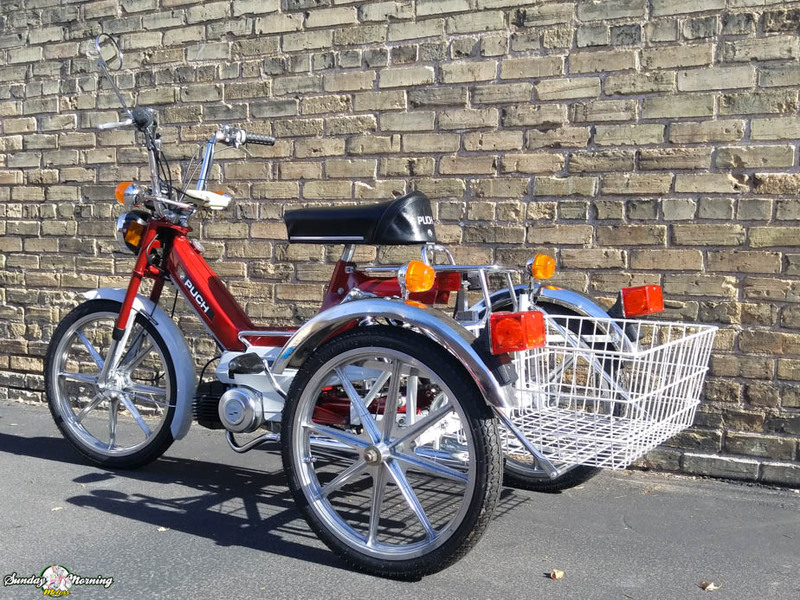 A restored 1977 Puch TriRad moped that will knock your socks off! Or at least get them dirty after you spend a full day riding this wonderfully rare and creative conversion. 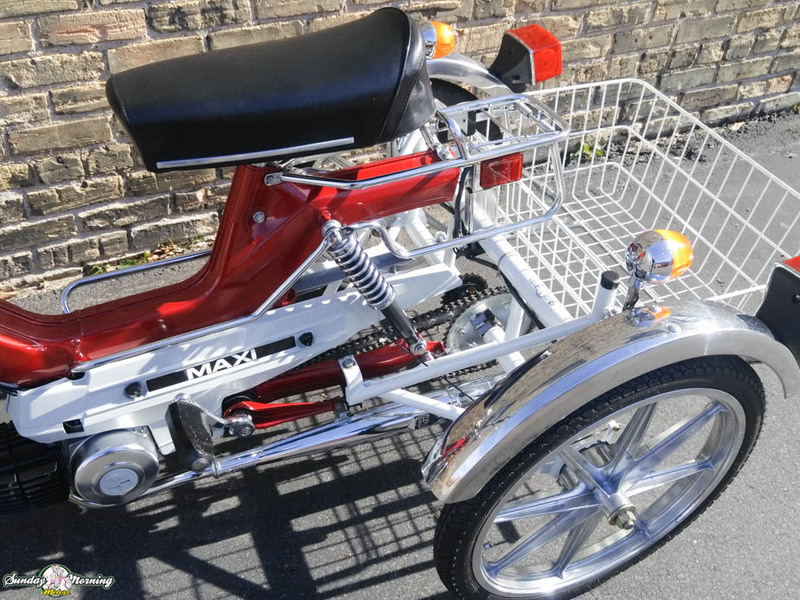 This TriRad has been professionally restored by Sunday Morning Motors, and is ready to fill any collection with the ultimate motorized conversation piece. Every single component has been replaced, reconditioned, rebuilt or repainted. This 3 wheeled moped has a lot more going on for it though than just its looks. The rebuilt automatic single speed engine has been performance enhanced to increase the horsepower rating to better handle the TriRad’s increased weight. We have also modified the gearing and clutch to help the moped get up to its top speed quicker when starting from a complete stop. 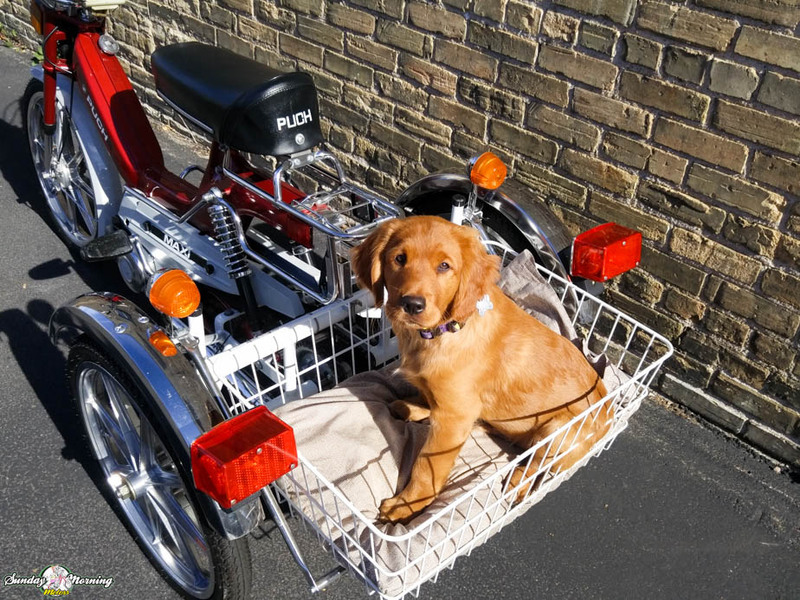 If you are looking for a daily rider that will make your commute not only safe, but comfortably fun as well, this is probably not the best choice. 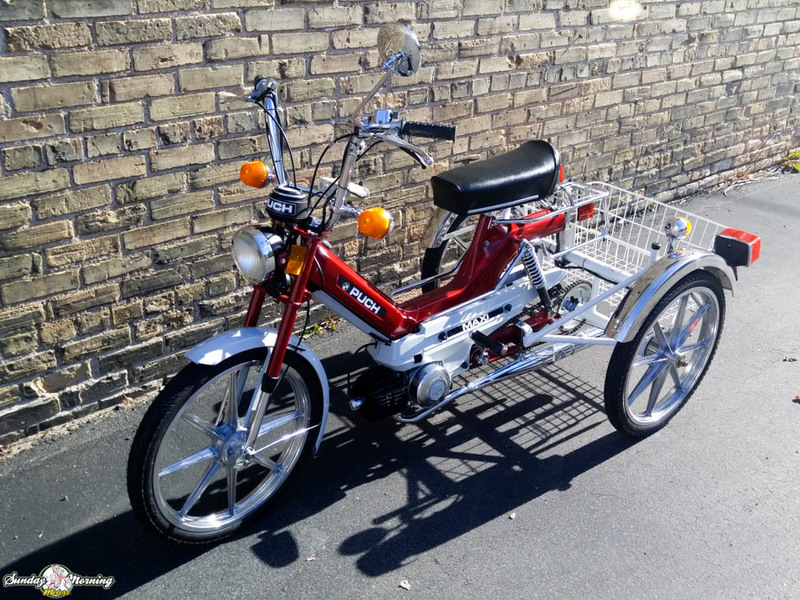 Riding a TriRad can be an exhilarating experience for anyone looking for that Saturday afternoon or Sunday morning thrill ride, but you may find that other mopeds would be better suited as daily riders. When you ride a TriRad for the first time, it is a little awkward. You have to shift your weight more than you would on a two-wheeled vehicle because the 3 wheels prevent it from leaning. Many people get the impression from looking at it that it would be easier to ride than a 2 wheeled moped, but that is just not the case. It takes some getting used to and a bit more physical strength and agility, but beyond that, just hang on and enjoy the ride! 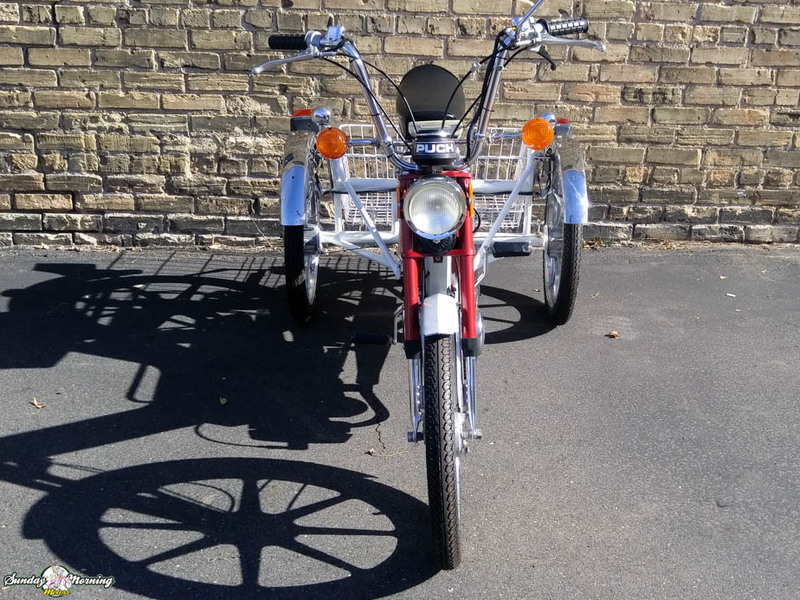 Contact us today to reserve this very rare and unique vintage moped! 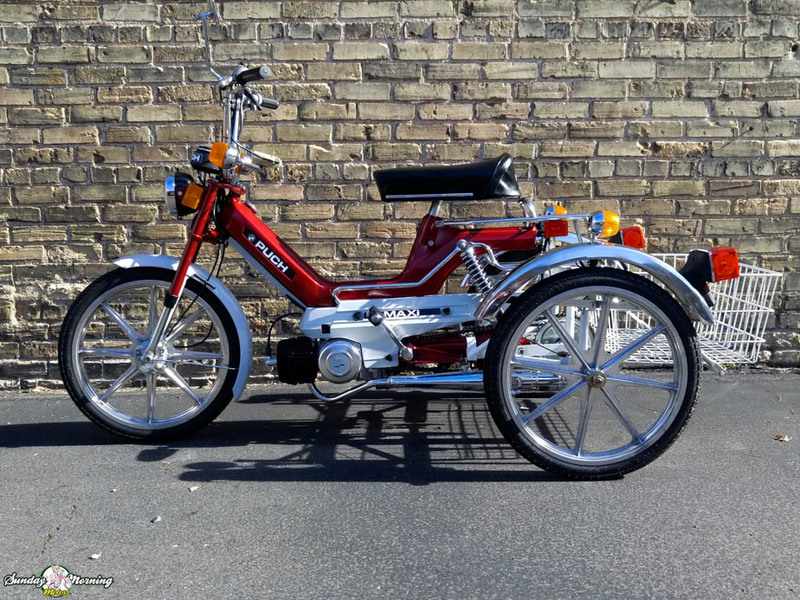 TriRad mopeds were a US made trike conversion that was assembled and distributed by Mopeds Midwest, Inc. based in Ames, IA during the height of the 70’s moped craze. 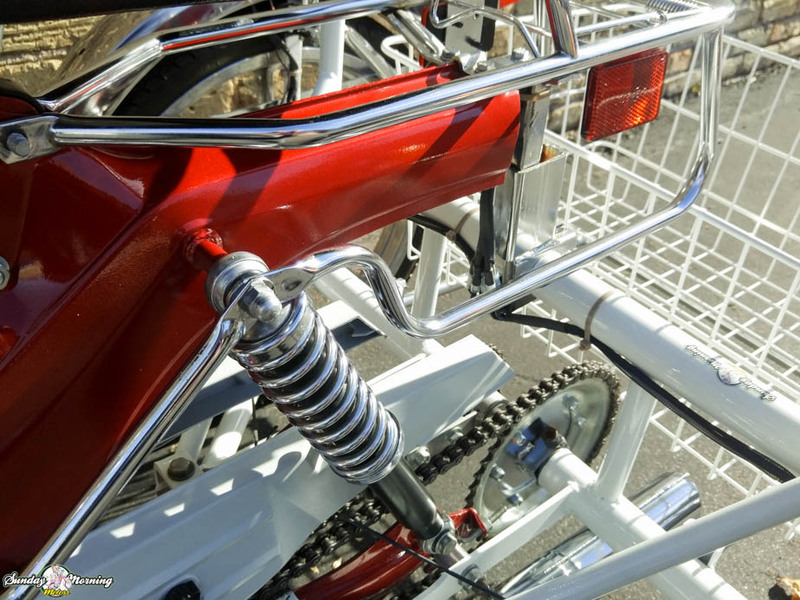 Through a cooperative effort between them and a California manufacturing company, they designed and built the conversion kits that were available and could be fitted to either Puch or Tomos mopeds with some modifications. The Puch TriRads were available in a few different options and packages. 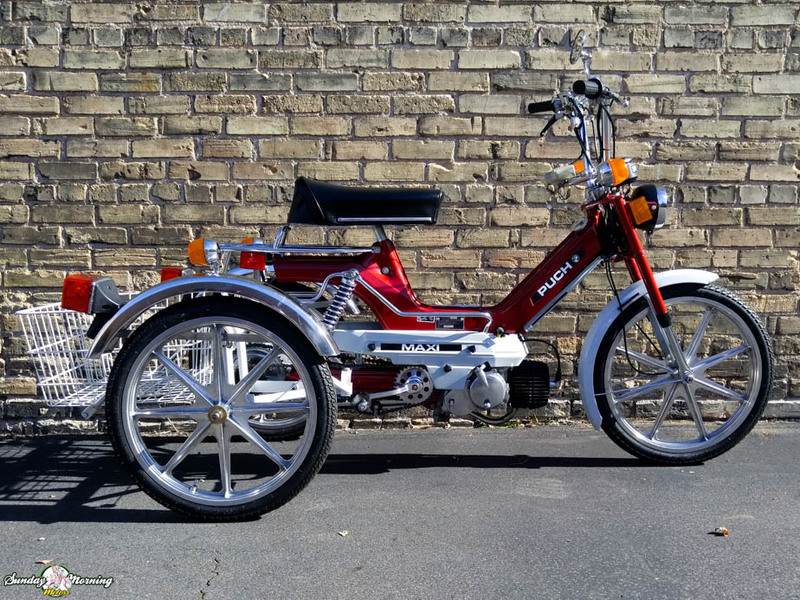 The base model Puch TriRad was single rear wheel drive and used an aluminum E50 single speed engine with an approximate top speed of 25 mph. The deluxe models were available with 2 speed automatic engines, high-torque cylinders and a rear differential axle. There were also other add-on options like windshields, leg shields, canopies and a few different cargo boxes. They even offered an ice cream vendor box that could be used during parades or at the beach. Prices for TriRads ranged between $1350 for the base model to $3200 for the ice cream package. That would be in today’s money between the $4700 and $11,000! 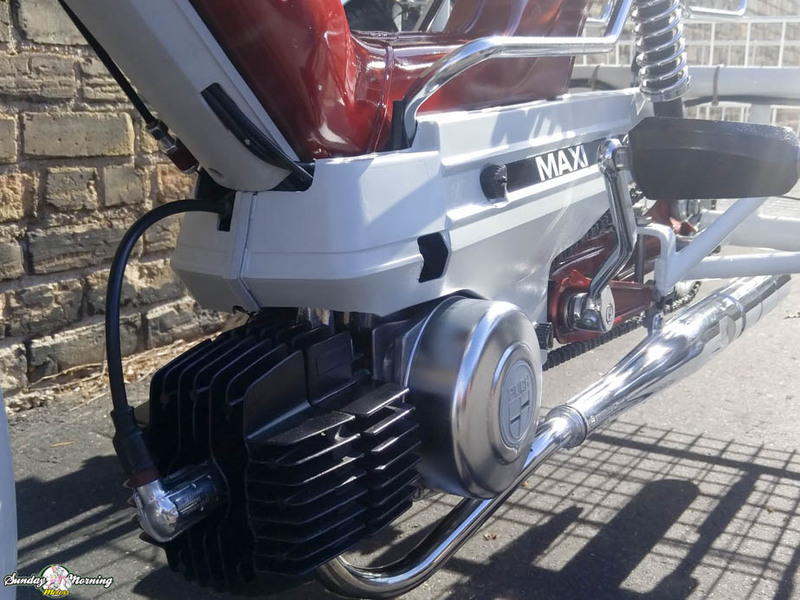 Though it is generally thought that TriRads were available between the years of 1979 and 1981, Sunday Morning Motors has had at least 2 original TriRads that were fitted to 1977 frames, so it is our belief the earliest models were being built from previous year moped stock when they were first being sold to the public.